UniTel Voice provides 1-800 toll free business numbers priced and designed for small business owners, home-based businesses, and startup companies. Our toll free numbers work with your existing phones. There’s no hardware or software to maintain and you can manage your 800 numbers and call forwarding settings completely online, along with loads of other features that can help your business stay connected and sound professional. Including getting a memorable vanity phone number that represents your brand. 1. Is UniTel Voice an affordable toll free number service provider? Yes. UniTel Voice is a cheap and easy way to get a toll free number for your business. And because UniTel Voice is a virtual phone system your toll free number has some really call features like the ability to set up and customize greetings, extensions voicemail. Send and receive faxes and text messages etc. You could call UniTel Voice a toll free number service with virtual phone system features. 2. How much does UniTel Voice cost? Our 1-800 toll free number plans start at just $9.99/month. The only difference between the plans is your monthly minutes the features and level of customer service is the same. UniTel Voice is priced to grow with your business, as your call volume increases you can upgrade or downgrade between plans at any time. 3. Do you have a free trial? We offer a 30-day risk-free trial, you can sign up for any toll free business number plan today and give it a try for 30 days, after that if it doesn’t meet your needs we’ll refund your money no questions. Also with UniTel Voice, you own your phone number. 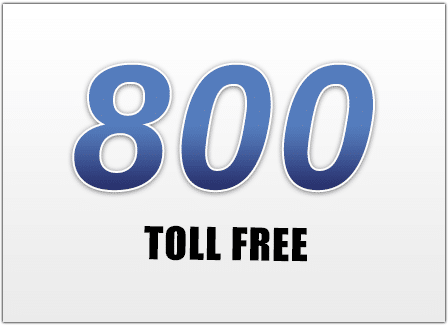 Down the road, if you’d like to move to another toll free service provider, you can take your 800 number with you, no strings attached. 4. Are there any contracts? With UniTel Voice, there are no long-term contracts. Everything is month-to-month. You can cancel anytime. No cancelation fees or sneaky terms locking you in like the big phone companies. Again, you own your phone number and can transfer to another phone company at any time. No transfer fees, either. 5. How do you compare to your competitors? When it comes to pricing, features, and quality we lead the pack. But what really sets us apart is our customer support. Our customer service team is 100% USA-based and we offer personal one-on-one assistance to every customer to help them set things up. It’s a free concierge-type service where we’ll meet with you over the phone and actually log in to your account and set things up for you. We’ll help you configure your phone tree, help you write the script for your greetings, and even get you a free profession voice talent recording for your main greeting. That way when your customers call your business you sound professional! 6. Do you have 24/7 customer support? Our system’s infrastructure is monitored 24/7/365 days a year to ensure your phone system never goes down. If there is ever a service interruption our technical support team is available to assist 24/7/365 days a year. For regular support issues like billing questions or how a feature works, we live USA-based support via chat or phone during business hours (M-F 8am-5pm CST) and online help center that is available 24/7.